Welcome to Afresh Publishing, LLC. We are pleased to offer you one of our latest products available for purchase. 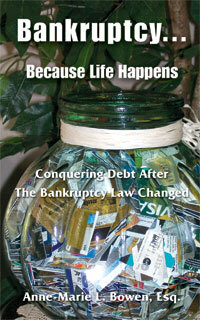 Please take a few moments to read about "Bankruptcy ... Because Life Happens," by Anne-Marie L. Bowen, Esq. Should you have any questions, please do not hesitate to send us an e-mail at info@afreshpublishing.com.